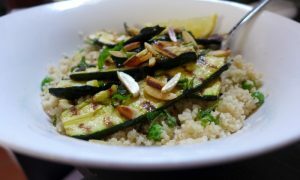 It is a simple dish of grilled zucchini with a couscous pilaf with vaguely North African/Sicilian flavours. Brush with olive oil and place on the grill over medium heat. 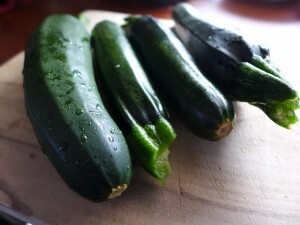 Don't move them and after 5 minutes check to see if there are nice grill marks on the zucchini and if so turn them over and cook for another 5 minutes. If not cook them until they do. Remove from the pan into a bowl, and squeeze some lemon juice over them. Cook the couscous according to the packet directions. I do mine in the bowl I am going to serve in, in a microwave, zapping it a minute at a time, checking and stirring with a fork. When it is done, stir in the frozen peas. There should be enough heat in the couscous to cook them. If not give them another 30 second zap in the microwave. If you don't like microwaves, all this can be done in a saucepan as well. I just like to minimise washing up. Stir through the preserved lemon, the drained currants (save the liquid) and half of the chopped mint. 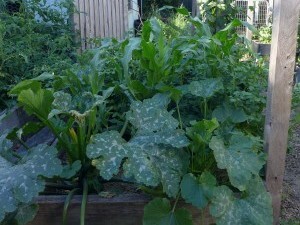 Check the seasoning and add salt, a little of the balsamic soaking liquid or lemon juice to taste. Lay the grilled zucchini on top of the couscous, scatter the remaining mint and the toasted almonds and serve with a lemon wedge.